Is it Okay for a Baby to Sleep in a Swing? According to the American Academy of Pediatrics, you should never leave your child sleeping in a swing. If a baby falls asleep in the swing, move her to her bed for the rest of her nap. If you want her closer to you during nap time, consider a bassinet or other flat, safe surface where you can place baby to keep an eye on her. You should never leave your baby sleeping in swings, strollers and other sitting devices. This is especially true if your baby is under 4 months old. At that age, they are like mini contortionists and may wiggle into a position that can block their airway or risk suffocation. After all, neck control is limited in young babies. If you leave your baby sleeping while sitting, there's a chance that her head may tip forward or to the side at an awkward and potentially lethal angle. The AAP recommends that babies always sleep on their backs. This reduces the chances of Sudden Infant Death Syndrome. If your baby has gastro-esophageal reflux and you're worried that she'll choke, you can rest easy knowing that babies have protective airway mechanisms to prevent that. If there is a reason that your baby shouldn't be placed on her back, such as an upper airway disorder or anatomic abnormality, speak to your doctor or pediatrician. 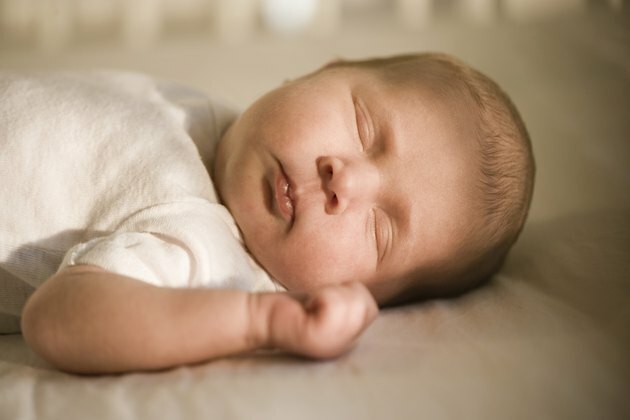 Since the connection between SIDS and sleeping position is so strong, your baby should continue to sleep on her back until the age of 1. You should have a firm sleeping surface, without loose bedding or soft toys. Newborns respond well to gentle continuous stimulation. Try rocking, walking, patting his back gently or giving him a pacifier. Some babies like to fall asleep to the sound of gentle music from a CD or the sound of rain from a noise generator. Remember that there may be a reason that your baby is having trouble getting to sleep, such as teething, illness, developmental changes or a noisy environment. Ask your pediatrician about ways to soothe symptoms for teething and illness if you suspect they're affecting your baby's ability to catch some shut eye. If your family is at risk of never sleeping again without the swing as a sleeping aid, you can still use it -- to a point. When your baby falls asleep in the swing, the AAP states that you should remove him immediately. Take him to his real bed. If your little sweetheart starts squawking the moment the swing stops, practice gently rocking him as you move him to a safe place to sleep. If back and forth doesn't work, try front to back. With some practice, you'll both adjust to this transitional stage of rocking as you move him. It may be easier if you move the swing closer to his bed before naps or bedtime so you can move him more quickly. Why Does My Toddler Sleep in His Crib Sitting Up? Is It Safe to Fall Asleep While Breastfeeding?